A polyacrylamide gel route was adopted to synthesize Bi4Ti3O12 nanoparticles and the effect of chelating agents on the products was investigated. 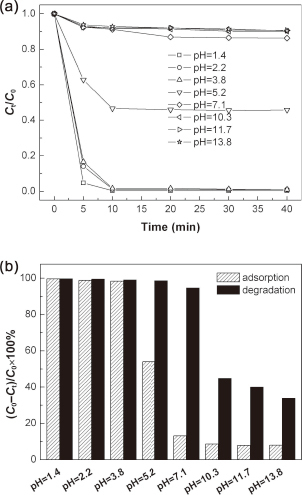 When citric acid and acetic acid is separately used as the chelating agent, single-phase Bi4Ti3O12 samples can be prepared at a calcination temperature of 500℃; however, when tartaric acid or EDTA is used as the chelating agent, a higher calcination temperature of 600℃ is required to produce single-phase samples. SEM observation shows that the as-prepared samples are composed of sphere-like or ellipsoid-like particles. The average particle size of the citric acid-, acetic acid-, tartaric acid-, and EDTA-resulted samples is centered around 32, 35, 90 and 120 nm, respectively. The bandgap energy of the four samples is measured to be 3.27 eV by ultraviolet-visible diffuse reflectance spectroscopy. The photocatalytic activity of Bi4Ti3O12 samples was evaluated by degrading RhB under simulated-sunlight irradiation, and the influence of pH value on the adsorption and photocatalytic degradation of the dye was also investigated. Ethanol, BQ and AO were respectively used as the scavengers of •OH, •O2− and h+ to investigate their effect on the photocatalytic degradation with the aim of revealing the photocatalytic mechanism involved. Based on the experimental results, the direct oxidation by h+ is suggested to be the main mechanism toward the dye degradation.